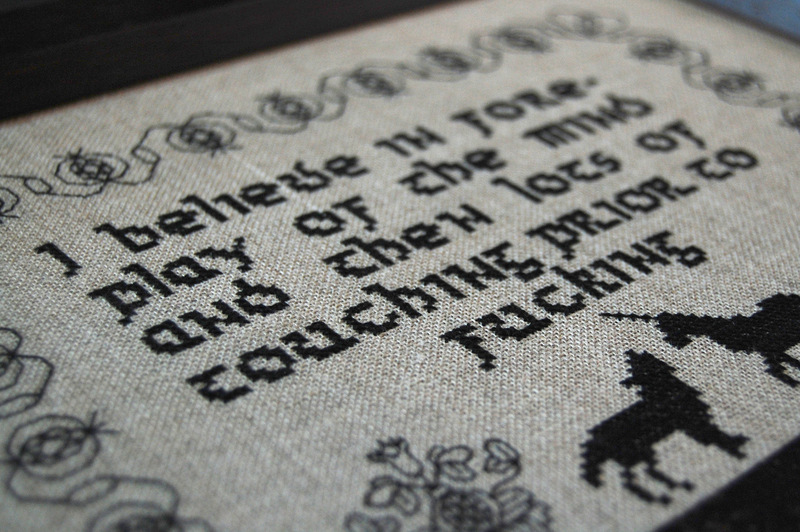 This is the first in my latest series of embroideries entitled ‘Unicorn Dating’. The unicorn is an age old symbol of masculinity and fertility and medieval tales of the unicorn tells us that the creature can only be captured by luring it out with a young virgin. With that in mind I posted an advert in the ‘Personals’ section of Craigslist on behalf of an imaginary sixteen year old girl in the hope of ensnaring a unicorn for myself. I didn’t find a unicorn but instead I received numerous responses from some other horny beasts which I proceeded to turn into cross stitched samplers. Having received in excess of fifty responses in the first six hours of having posted the advert this project is ongoing.